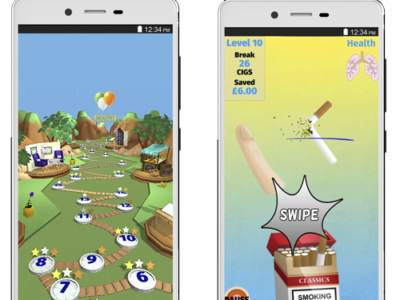 Cigbreak Case Study: Break the Smoker’s Habit – Maldaba Ltd.
A games developer from London has developed a mobile phone game called ‘Cigbreak’ aimed at smokers wanting to quit the habit. Cigbreak has been developed by Hope Caton, writer of the global hit video game TombRaider IV: The Last Revelation. Together with business partner Robin Bell, they have formed Healthy Games with the aim of making games that improve health. ‘Cigbreak’, developed with the support of Camden-based IT firm Maldaba Ltd, replicates the ‘Fruit Ninja’ game by getting players to break cigarettes in order to gain game rewards. Hope commented: “Cigbreak is the UK’s first smoking cessation app in the form of a game. It was co-created with a medical team and was tested on smokers throughout development. The result is a game that is fun for smokers to play, while reinforcing their motivation to quit smoking. “Research also indicates that 52% of video game players smoke while 37% of non-video game players smoke. Games form the largest market share of apps comprising 33% of all downloads. “An estimated 69% of people in the UK aged 8-74 play games on average 14 hours per week. Smokers reported playing for longer durations each week and 63.7% of smokers believed computer game-based intervention would motivate them to quit,” added Hope.